This is the classic Music Together® class, one that a child can attend from birth through age five—and through all nine song collections. Each week in Music Together Mixed-Age Classes at Music Together Vivo, babies, toddlers, preschoolers, and the grownups who love them gather for 45 minutes of fun-filled family music time. Your teacher will lead you and the other families in music activities ranging from lullabies to full-on jam sessions (with child-friendly instruments, of course). It’s so much fun you won’t realize how much learning is taking place! Weekly 45-minute classes teaching a new song collection every session. Fall, winter and spring sessions are 10-12 weeks, summer session is 6-8 weeks depending on location. One (1) CD each semester with the songs, rhythm chants, "play-alongs," tonal and rhythm patterns used in class. BRAND NEW songbook illustrated by award-winning artist Jamie Kim. New families receive the Music and Your Child: A Guide for Parents and Caregivers book. 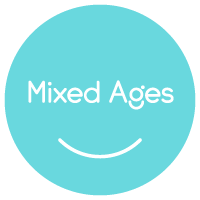 Try a Mixed-Ages Music Class for free! <Select> <Any> Lutheran Church of the Abiding Presence Nativity Lutheran Church The Italian Cultural Society of Washington D.C.